For the last decade, Margaret Regan has reported on the escalating chaos along the Arizona-Mexico border, ground zero for immigration since 2000. Undocumented migrants cross into Arizona in overwhelming numbers, a state whose anti-immigrant laws are the most stringent in the nation. And Arizona has the highest number of migrant deaths. Fourteen-year-old Josseline, a young girl from El Salvador who was left to die alone on the migrant trail, was just one of thousands to perish in its deserts and mountains. With a sweeping perspective and vivid on-the-ground reportage, Regan tells the stories of the people caught up in this international tragedy. Traveling back and forth across the border, she visits migrants stranded in Mexican shelters and rides shotgun with Border Patrol agents in Arizona, hiking with them for hours in the scorching desert; she camps out in the thorny wilderness with No More Deaths activists and meets with angry ranchers and vigilantes. Using Arizona as a microcosm, Regan explores a host of urgent issues: the border militarization that threatens the rights of U.S. citizens, the environmental damage wrought by the border wall, the desperation that compels migrants to come north, and the human tragedy of the unidentified dead in Arizona’s morgues. 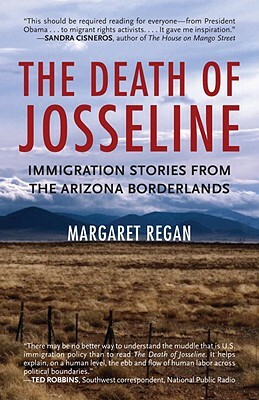 Margaret Regan writes for the Tucson Weekly and has won a dozen journalism awards for border reporting, including two national prizes. She lives in Tucson.